This week Congress has been debating the upcoming year’s budget, with the new Republican leadership in the House of Representatives vowing to cut spending as much as possible. Included in those spending cuts is US Foreign Aid, or Official Development Assistance (ODA). House Republicans proposed up to 50% cuts in the funding of critical development projects, in areas such as health, hunger and sustainable development. These cuts would be detrimental to the world’s poor. These cuts are supported under the pretense of reducing our $1.5 trillion deficit;however, cuts in foreign development assistance would do little to rectify our financial woes but much to hurt the poorest people of the world. Americans typically favor cuts in ODA spending, largely adopting the notion that “we have to help ourselves before we can help others”. Unfortunately, this view is sadly misguided, as the US allocates less than 1% of its budget toward foreign aid—hardly a large enough percentage to put a dent in our deficit. Additionally, only 0.18% of our GDP is utilized for foreign aid, in noncompliance with the 2002 international agreement—the Monterrey Consensus—that called upon all developed countries to allocate at least 0.70% of their GDP for development spending. 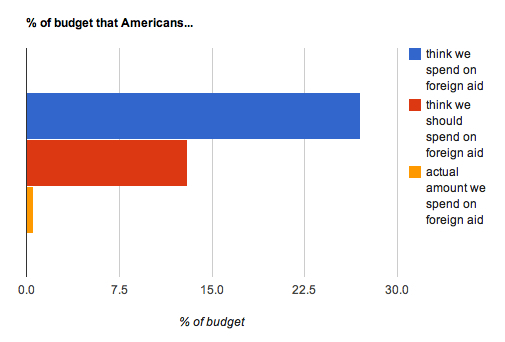 And incidentally, the US spends almost 30 times the amount on aid on the military, with defense comprising almost 15% of the budget, yet no cuts are to be made there in the budget proposal. And where ODA spending does little to hurt the American economy, it does much to save the lives of millions of impoverished people all over the world. US foreign aid has taken many significant strides on the path toward the end of global poverty: With the help of US foreign aid, deaths from Malaria have been cut in half in Rwanda, Ethiopia, Zambia and Eritrea; child mortality in Senegal has decreased by one third between 2005 and 2008; the number of HIV-positive Africans receiving life-saving antiretroviral medication increased from 50,000 in 2002 to more than 3 million now; and 42 million more African children were able to attend school between 1999 and 2007. Funds that are just a drop in the bucket for our budget are making real and life-changing differences for millions of people—we cannot allow these cuts to be passed. After 4:30 a.m. Saturday morning, after an all-night session, the House passed a bill that would cut $60 billion in spending over the next seven months, including in foreign aid. The Senate will negotiate on Monday, February 21, and the budget must be passed by March 4. There is little time, so we must act immediately. Do not allow these decisions to be made under the false assumption that we are helping ourselves in the process, when in reality we would be responsible for the deaths and deteriorating lives of the millions who rely on this aid. Call you Senators and Representatives—tell them that the world’s poor are important to you. Your voice would make all the difference in the world. Thank you for your response and I am glad that you found the graph informative! It is an incredibly pervasive misconception that we spend much more on aid than we do, and I feel that many people support cutting it because they truly have no idea how much we really do spend. Unfortunately, I am afraid to admit that I agree that xenophobia has much to do with the discussion on foreign aid, and the American mindset that we should not help others until we “fix” ourselves first. Now while I agree that much foriegn aid can be redirected to more effective and sustainable programs, I do not agree with cutting it whatsover. Nor do I feel that it should be an “us first” type of mentality. We are all human aren’t we? And the fact of the matter is that the basic needs that we take for granted in the US are largely absent in these poorer countries, and our aid helps to make critical, albeit slow, improvements in the lives of those who need it most. Again, thank you for your insight! The graph really helped me understand the difference between perception ad reality: thanks for it because in my mind spending on foreign aid was much, much higher given the amount of talk that surrounds it. Is the policy, talk, debate an extension of American xenophobia and deep suspicion and subtle hatred of the “dread Other”?